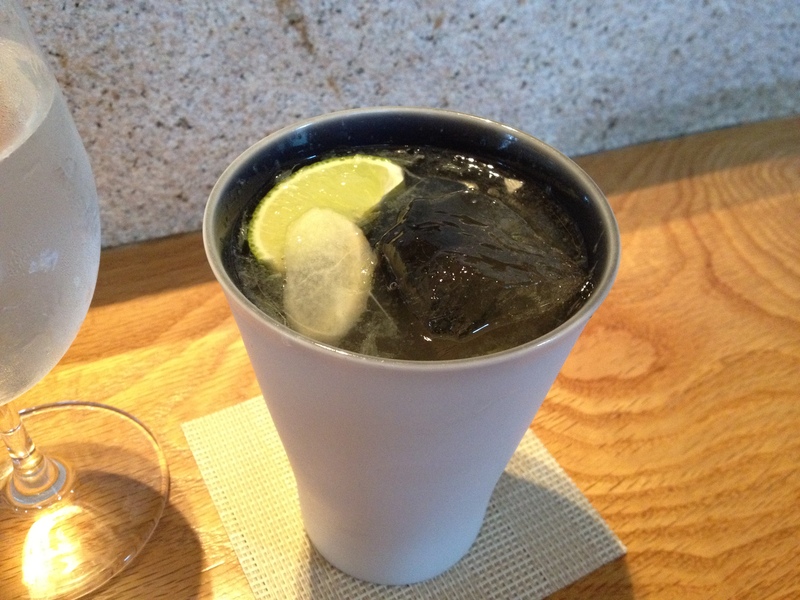 -house-made ginger ale with rice shochu and lime. Monte: The cocktail was light and refreshing, which was pleasant since it was hot outside at the time. Monte: Really light and floral, there might be something more poetic about it but it went over my head. 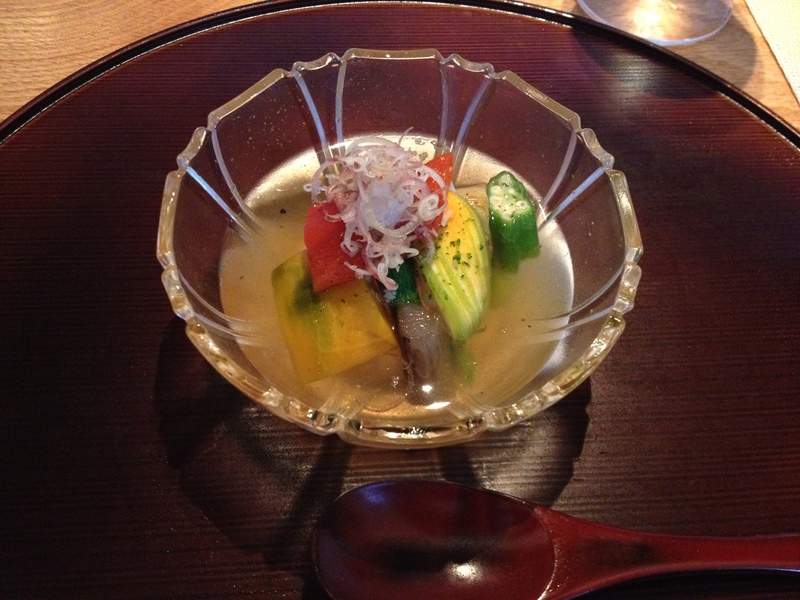 Chilled Summer Vegetables in Dashi Broth. -includes a zucchini blossom stuffed with a dumpling of scallop and crab. Monte: Again, it was light and freshly floral. Cooling and soothing. 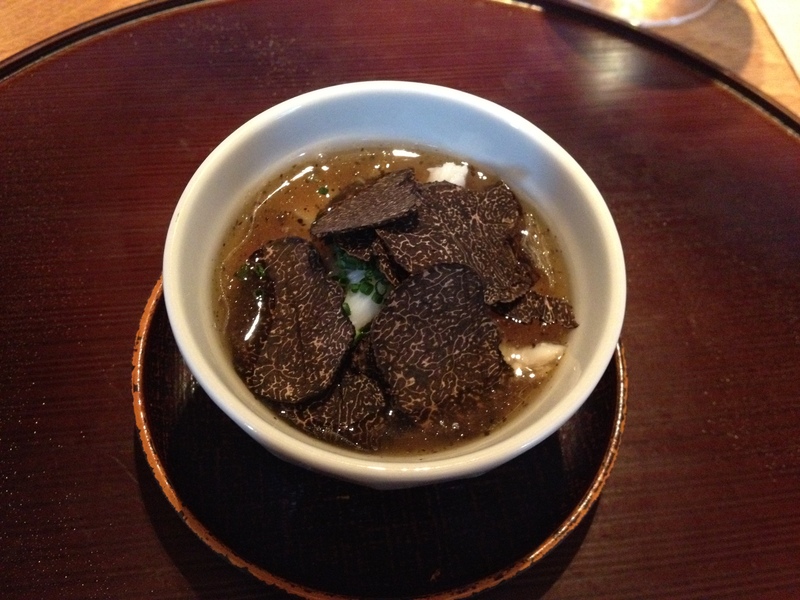 Golden Crab Egg Custard “Chawan-mushi” with Truffle Ankake Sauce. -sauce of golden crab with black truffle pâté. -finished with a few Australian black winter truffle slices. 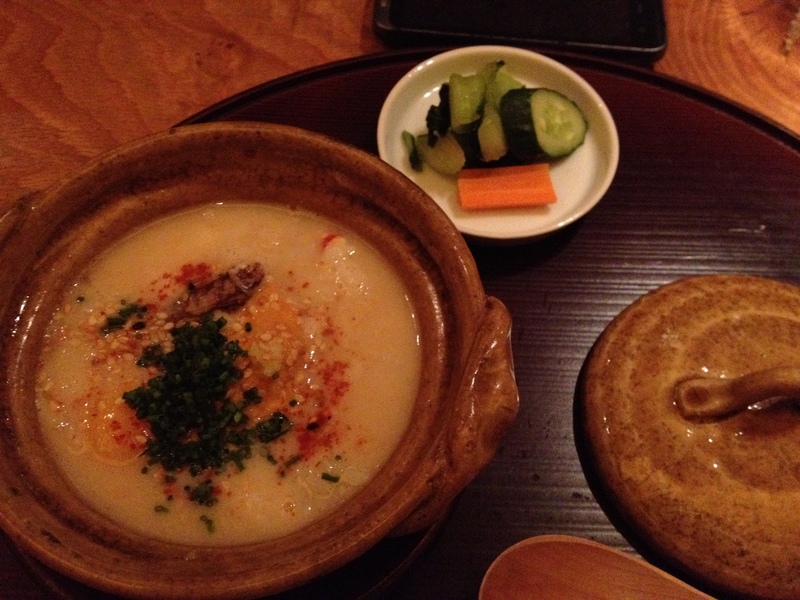 Monte: After the first chrysanthemum tea and chilled vegetables, this truffled chawanmushi tasted like a heavy hitter. That’s just in contrast to the prior dishes though – after my taste buds adjusted, I found this dish to be very well-balanced and I liked the sweet crab meat. -Front left: Shima aji (striped jack). 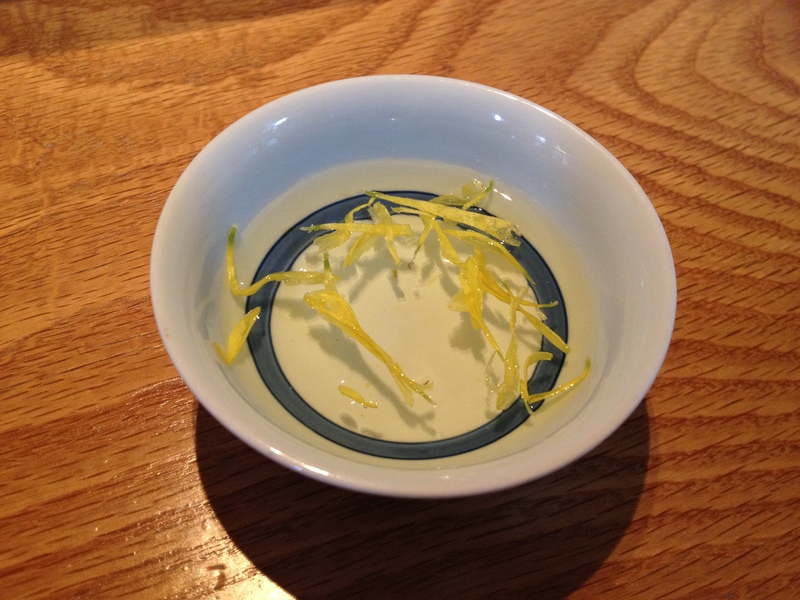 -Bottom: Wasabi and a chili-and-daikon mix. 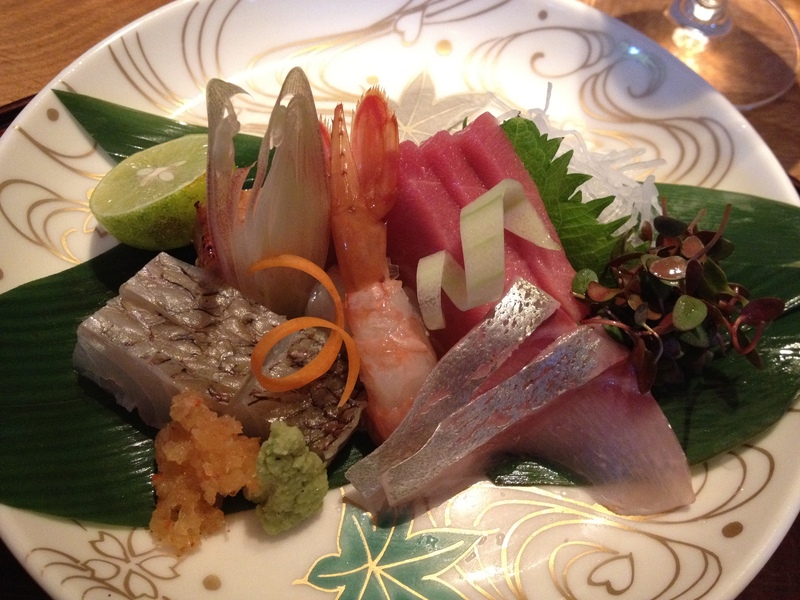 Monte: The sashimi was very fresh, although nothing to go out of your way for. Monte: aaand we go back to the gorgeous veggies. 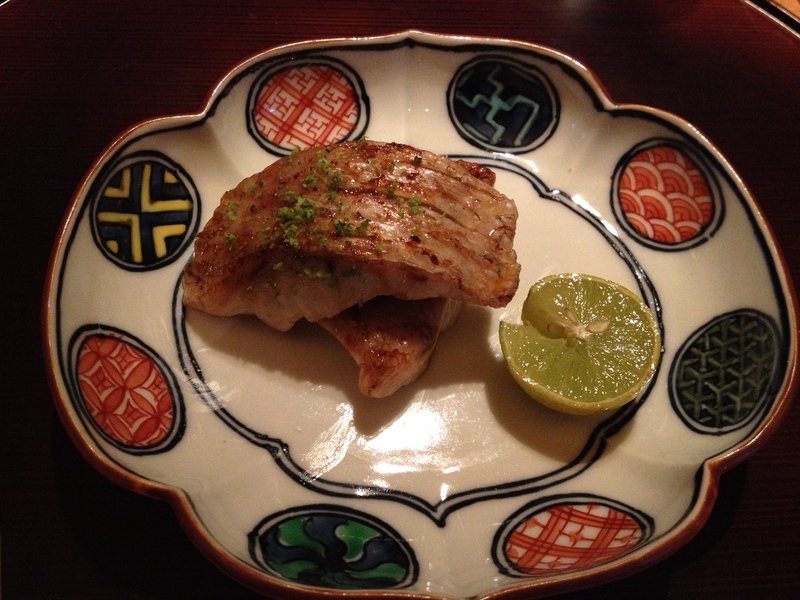 Yuzu Perfumed Akamutsu (Grilled Rosy Seabass). 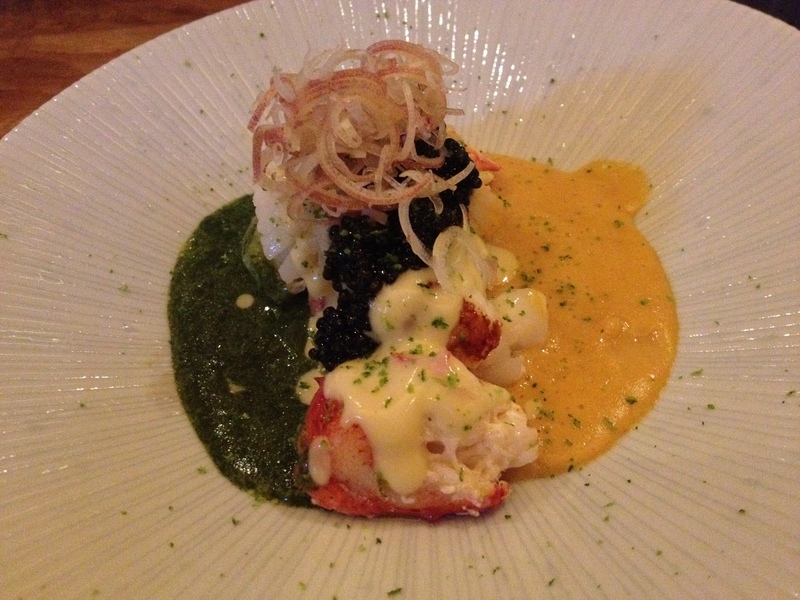 Maine Lobster Tail with Uni Sauce, Caviar, Yuzu Miso Cream (left), and Chrysanthemum Purée (right). Monte: This dish was pretty fun to eat and I liked the multiple sauce options. I ended up liking the yuzu-miso one more, it had this juxtaposition of deep earthiness and light-herbalness that was quite delightful. -with hearts of palm, cape gooseberries, and a mint licorice leaf. Monte: All the flavors of a great corn chowder, without any of the heaviness. I would love to know the secret to make this at home. 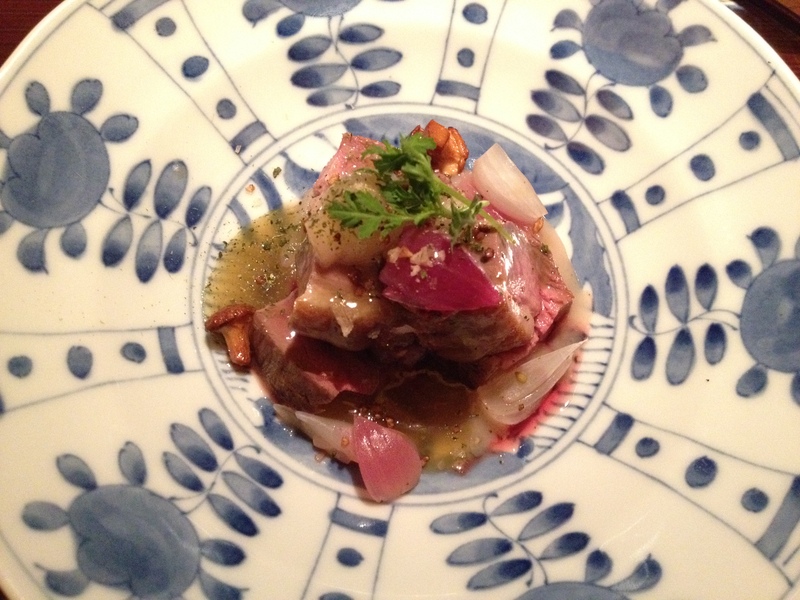 Seared Duck Breast marinated in Green Tea. 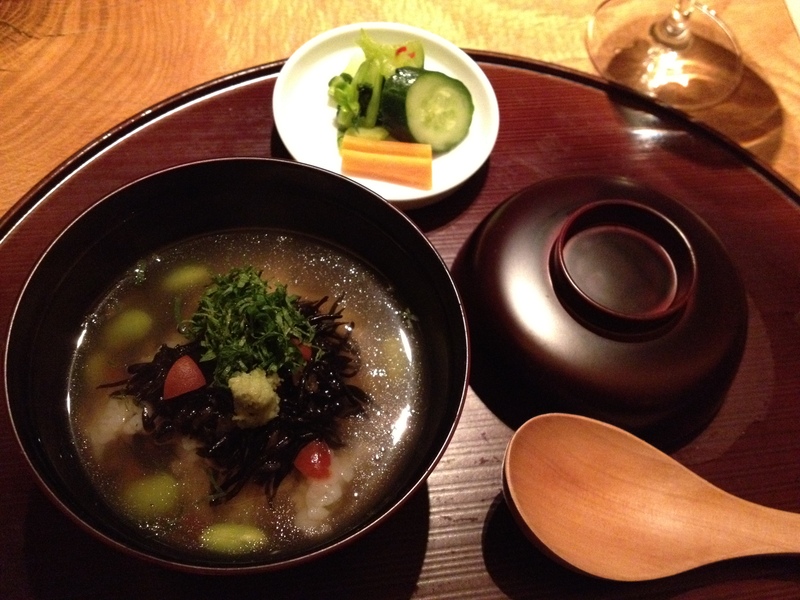 Chazuke Broth with Steamed Rice. 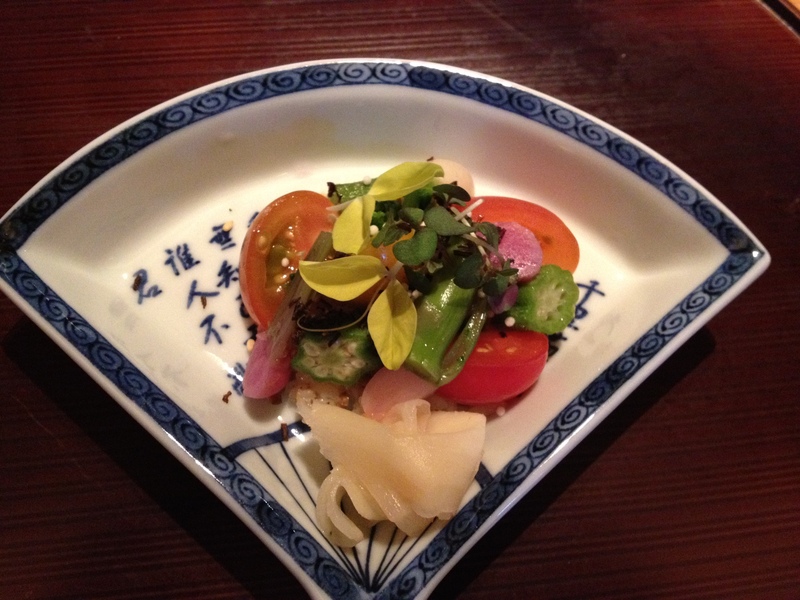 -with crispy ume plum, hijiki seaweed, and dried daikon strips. 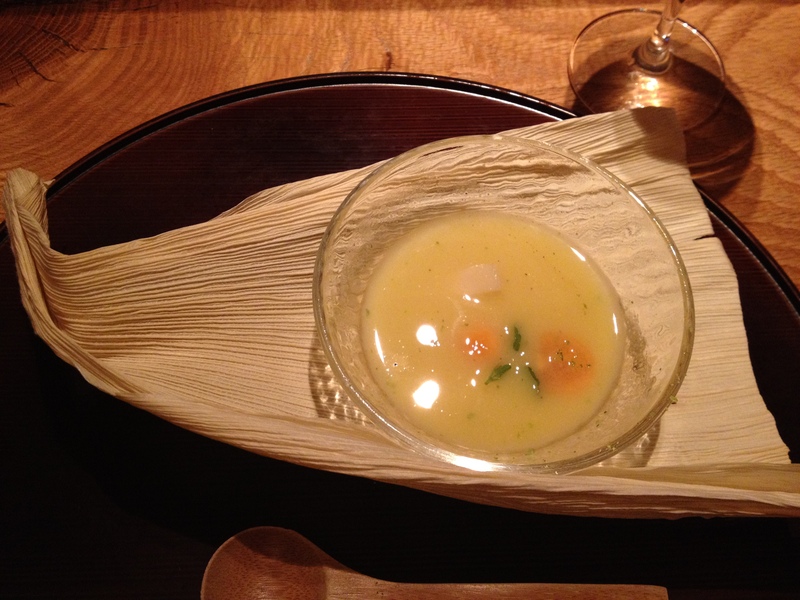 -with fresh uni and sake-kasu broth. 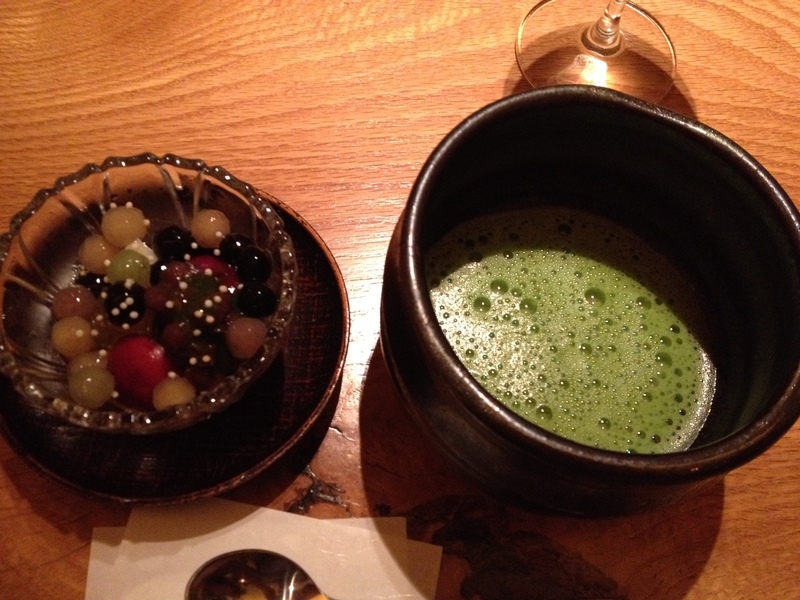 Matcha green tea and wagashi. 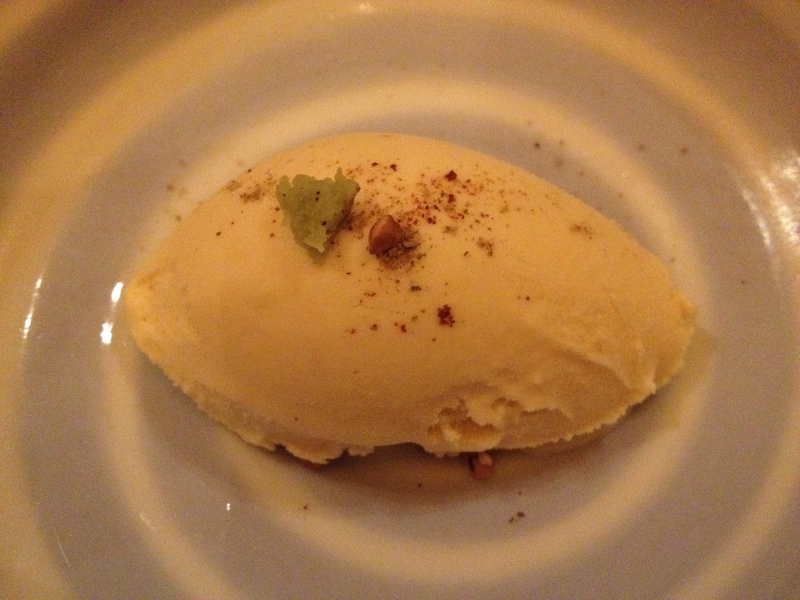 Monte: Slightly salty/savory, but mostly sweet. It’s a really clever and well-balanced ice cream. I certainly would’ve never thought soy sauce would be a delicious ice cream flavor, so this was a great surprise! -Right: Rice crackers topped with shiso powder. 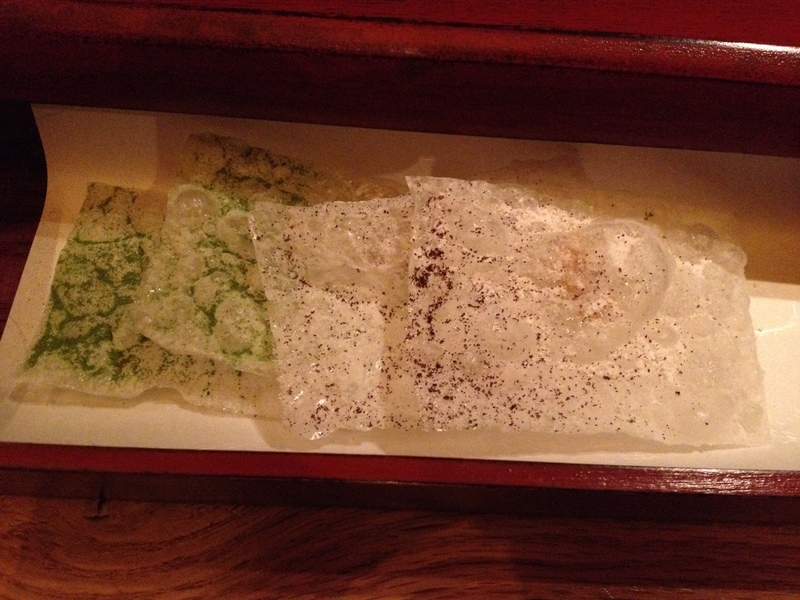 -Left: Rice crackers topped with green tea powder. Monte: The rice crackers were a great way to end the meal and just munch while reflecting on the great meal. They were almost gummy once you bit into it, which was a fun surprise. This was only my second kaiseki meal, so I don’t have as much of a reference as to how it compares to other experiences, but I personally thought it was really good.